We aim to ensure our pupils get the best possible start in life, from the moment they join us in the early years. Many pupils start school behind where you would expect them to be, and we help them to catch up quickly, so by the time they leave primary school they are ready for secondary. At the end of the Early Years (the end of the academic year in which the child turns five) teachers assess a child’s development, helping to support a smooth transition to Year 1. Children achieving a ‘good level of development’ are those achieving at least the expected level within the following areas of learning: communication and language; physical development; personal, social and emotional development; literacy; and mathematics. 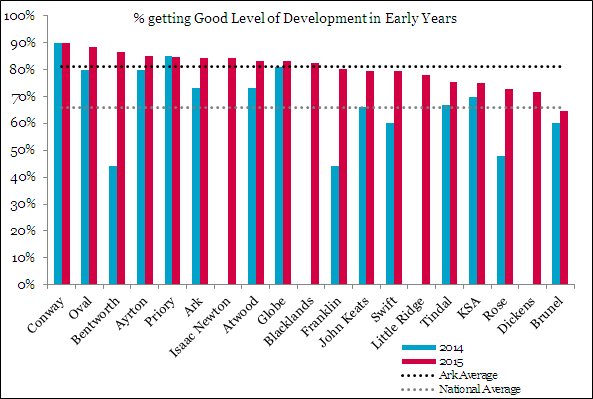 All but one of our primary schools outperformed the national average for a ‘Good level of development’ in the Early Years Foundation Stage, with an Ark average of 81% (up 11 points on 2014) compared to a national average of just 66%. There were some real success stories: Ark Bentworth saw the number of pupils getting this level up by 43 percentage points, Ark Franklin was up 35 points and Ark Rose up 27 points. Every Ark school improved other than Conway which stayed at 90%. Ark schools use the Ruth Miskin phonics curriculum to teach early reading skills. 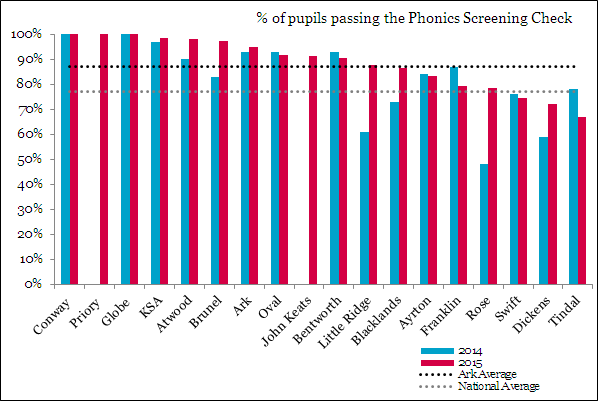 The phonics screening check is a national test of reading progress in year 1. This year, Ark schools are ten points above the national average, with 87% passing the phonics check compared to 77% nationally. Three of our schools – Ark Priory, Ark Globe and Ark Conway got 100% in the phonics check. Level 4 is the level that students at the end of primary school (key stage 2, age 11) should reach in reading, writing and mathematics. Our key stage 2 scores continue to improve with 72% getting the expected combined ‘Level 4’. This represents a five point rise on last year’s average of 67%. There was also a five point rise for those getting Level 5 – above expected levels. Six of our schools are now above the national average (80%) at key stage 2. Eight schools have improved on last year. Ark Bentworth went from 68% to 92% of pupils getting the expected level 4. This makes the school the most improved primary school in Hammersmith and Fulham, and in the top 2% of most improved schools across the whole of London, where there are nearly 1,000 eligible schools. 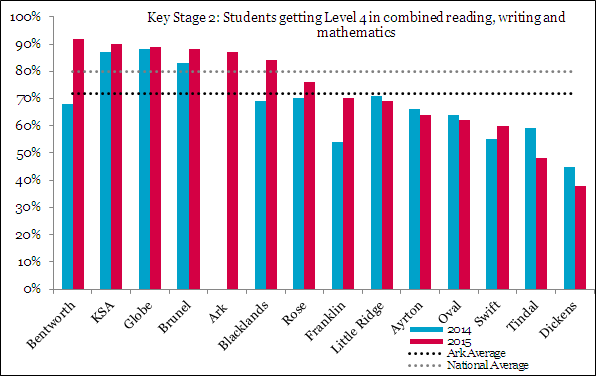 Ark Franklin Primary in Brent also saw a 16 point improvement. Ark Academy posted an impressive first set of results with 87% getting level 4; and in Hastings, Ark Blacklands went from 69% to 84% - making them the most improved primary school in Hastings.